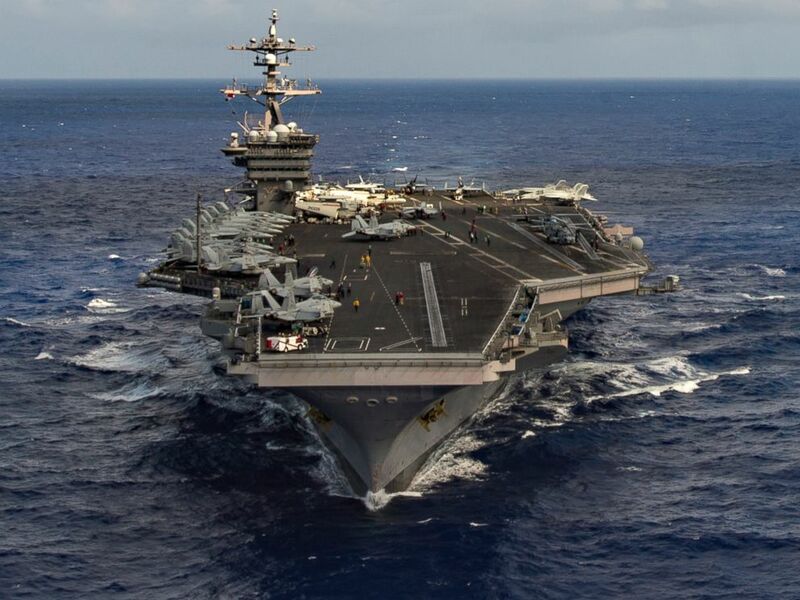 The aircraft carrier USS Carl Vinson strike group is heading to the Sea of Japan amid heightened tensions between the U.S. and North Korea and following multiple missile tests conducted by the regime this year. The strike group, comprised of the aircraft carrier and three other ships, had just completed a port visit to Singapore before receiving orders to head into waters east of the Korean peninsula. What US options are 'on the table' with North Korea? The Navy said the strike group "will operate in the Western Pacific rather than executing previously planned port visits to Australia." ABC News takes a closer look at the strike group and its deployment. Why sail to the Sea of Japan now? Tensions remain high on the Korean peninsula as North Korea has conducted four missile launches this year. U.S. officials have said it appears another North Korean underground nuclear test could occur at any time. And U.S. officials have speculated the timing of a nuclear test or additional missile tests could be tied to the upcoming April 15 birthday of Kim il Sung, North Korea’s founder. Deploying the strike group is a show of American military force during a critical time in North Korea's missile and nuclear development. If North Korea conducts another missile test, the strike group's location in the Sea of Japan means it could be in the missile's flight path. In early March, North Korea launched five medium-range Scud missiles, four of which traveled more than 600 miles, the upper limit of their range, before plunging into the Sea of Japan. Three of the missiles landed in waters in Japan's economic exclusion zone, which extends 200 miles from its shore. National Security Adviser H.R. McMaster called the decision to send the strike group to the Sea of Japan "prudent." "Well, it's prudent to do it, isn't it?" McMaster told Fox News on Sunday. "I mean, North Korea has been engaged in a pattern of provocative behavior. This is -- this is a rogue regime that is now a nuclear capable regime." McMaster said that Chinese President Xi Jinping agreed with President Trump that North Korea's behavior is "unacceptable" and that the Korean Peninsula must be denuclearized. Xi and Trump held meetings at Trump's Florida Mar-A-Lago resort last weekend. "The president has asked to be prepared to give him a full range of options to remove that threat the American people and to our allies and partners in the region," McMaster said. The aircraft carrier USS Carl Vinson (CVN 70) transits the Pacific Ocean in this Jan. 30, 2017 photo. What is a strike group? A carrier strike group (CSG) is a grouping of ships that travel together, usually consisting of a destroyer and missile cruiser in addition to the aircraft carrier. The grouping can be formed and dismantled at any time as the mission sees fit. The Navy says that strike groups can be deployed for a variety of reasons, including "protection of economic and/or military shipping," "protection of a Marine amphibious force while en route to, and upon arrival in, an amphibious objective area," and "establishing a naval presence in support of national interests." Prior to the USS Carl Vinson strike group's stop in Singapore, the ships spent two weeks off the coast of South Korea participating in annual military exercises with that nation. The group consists of the aircraft carrier USS Carl Vinson (CVN 70) the guided missile destroyers USS Wayne E. Meyer (DDG 108) and USS Michael Murphy (DDG 112), and the guided missile cruiser USS Lake Champlain (CG 57). The ships, based in San Diego, California, have been deployed since January 5. The USS Carl Vinson is one of ten Nimitz-class aircraft carriers belonging to the US Navy which are the largest warships in the world.